A few weeks ago, T & I cracked down after nearly two years of sleeping on a worn out mattress that should have been tossed...well...two years ago! After testing ALL of the mattresses in the furniture store (for obvious reasons, C loved this plan. Did you know there are remotes for the beds with incline adjustments and massagers...me either! Of course, C spotted these right away and after playing with said remote while I tested the bed, he almost had me convinced that we needed the upgrades! ), we ended up going with this Sealy Posturpedic Premier Hybrid which has a mix of a memory foam topper with springs underneath. A BIG problem with our previous mattress was that we were constantly rolling into the middle, and after speaking with the 'mattress expert' at the furniture store, we learned that many people with pillow topper mattresses have also complained about this issue. Anyways...the foam topper is the latest and greatest in all things mattress, and we loved how it conforms to our bodies making it nearly impossible to feel when one of us gets up in the night. Also great...it has cooling gels in the memory foam to prevent body heat from being trapped. AND...drum roll please...it's a KING! Because our previous...never to be mentioned again bed...was a queen size, this means I am now redecorating our entire bedroom. While I loved our bedding and headboard from our queen bed, I'm leaning in a new direction for our new bed that's maybe a little less French country, and a little more clean and modern...think plain white with pillows and throws for accents. First on the agenda, being that it's still relatively chilly, we were in need of a new down comforter. After reading many...many reviews, I ended up ordering this version (scored 20% off with coupon! ), and we have been loving it. Not too hot, not too cold. In terms of a headboard, I've been leaning towards an upholstered headboard, and think this style from Pottery Barn could be just what I'm looking for. Now the biggest question on my mind is do I go with oil-rubbed bronze for the headboard nailheads & curtain rods, or pewter. Our other bedroom furniture has oil-rubbed bronze hardware, but I ordered the pewter curtain rods and now can't decide if that is the right move. HELP! With spring just around the corner, I've been on the lookout for some new kicks to update my closet. I really need a new pair of neutral spring/summer sandals in white or beige, but the options are endless, and I'm having a hard time finding some that I could wear with everything. These sandals (currently being price-matched!!) are near the top of my list, but I'd also like to find some sandals that aren't a gladiator style that could go with some of my more feminine summer dresses. While searching for sandals...of course, I got sidetracked, and stumbled across these sneaks that I immediately fell in love with. They'd be perfect for pulling together a casual spring everyday look paired with a plain white/pink T, grey baseball cap, and jean capris. Ahhh...isn't it amazing how sometimes just one staple can inspire an entire look? Easter basket gift to myself perhaps? Other fashion related things on my mind...I bumped into a friend the other day who was looking ooooh so stylish dressed in capris, flats, sweater layered over a button up, and theee most polished looking trench coat I've seen in a while. A great trench has been on my wish list for the longest time, and after seeing it so chicly styled for spring, it may need to appear in my closet sooner rather than later. This or this version can usually be found on sale, and might be just the thing for my spring wardrobe. Next week, we are headed to the sunshine state for some rest & relaxation...ah hem...T is attending a medical conference, and C & I are going to be completely on our own in a relatively unfamiliar place during the day for most of the week. I know that C will have so much fun swimming and playing at the beach, but a toddler can only take so much time in the sun before a burnout happens. Did I mention that we will ALL be sharing a non-suite single-room hotel room for 5 days? Eeek! While I'm sure our hotel will be nothing short of spectacular, I don't think it will work to quarantine C in the bathroom for sleeping just so that T & I don't have to go to bed at the same time. It happens people! You'd be amazed how many people have suggested it to me! Ultimately though, the idea of putting C in the bathroom to sleep feels a little bit like neglect or punishment, and I'd rather not have a guilty conscious all week about his sleeping arrangements - not to mention he'd obviously hear us getting ready for bed and wake up anyways. Bring on the uncomfortable sleeping situation where C knows we are in the same room and won't stop crying until he joins us in the middle of the bed! If it goes anything like usual, after finding himself in bed with us, he'll roll around and play for most of the night, and finally find his comfortable spot situated crosswise between us with his feet in our faces! At the very least, maybe we'll be able to sit on the balcony for a bit and he can get couple hours of shut-eye before we head to bed. 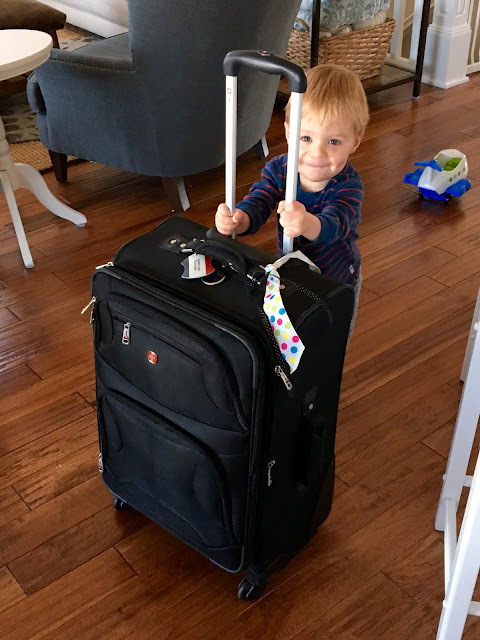 I'll be happy when the second leg of our trip arrives and we aren't staying in a hotel so he can be in a separate room from us! Baby W #2 is headed our way! 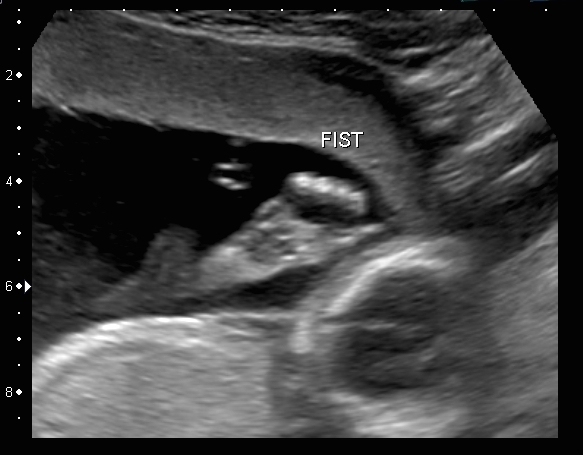 We had our 20 week ultrasound this week and got to have a 2nd peek at baby! 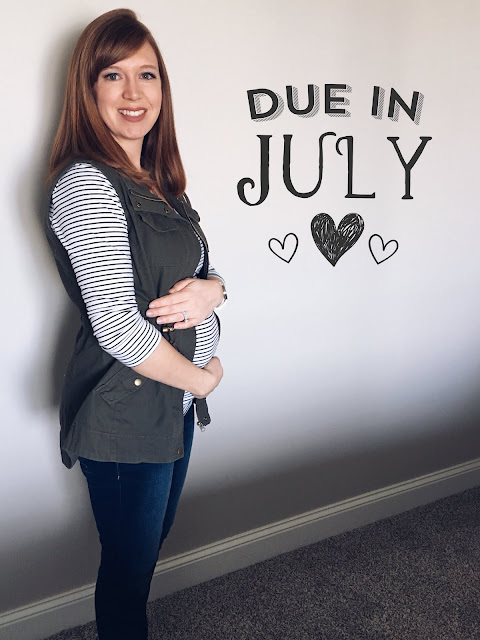 Our first peek was back in late January, when my Doctor ordered an ultrasound to firmly establish dates and rule out multiples...Thankfully, we had no surprises! 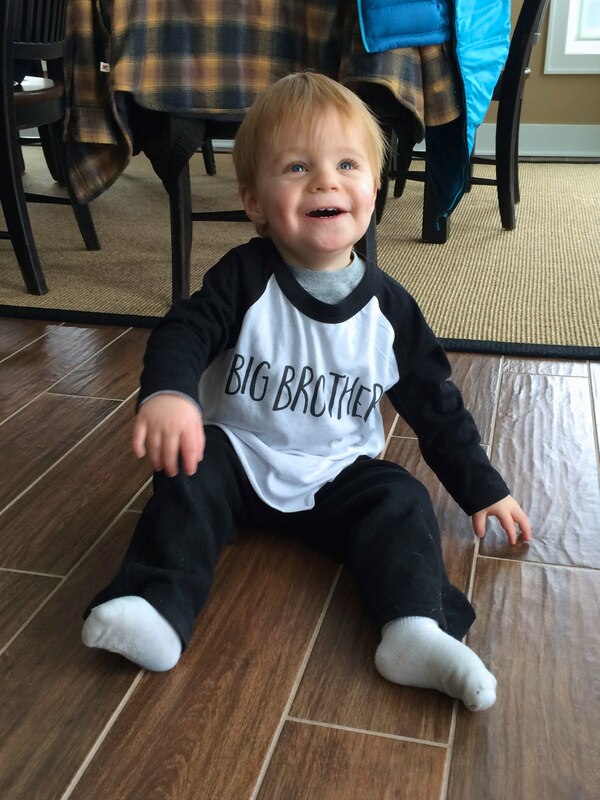 Speaking of surprises, we told our family about Baby in late January. I got C a shirt that says Big Brother on it, and we just waited to see how long it took everyone to figure things out. Prize goes to Grandma S for noticing immediately, while it took Grandma J almost 30 minutes to notice! This week, we learned that everything is progressing normally, and we can all breathe a little more easily. 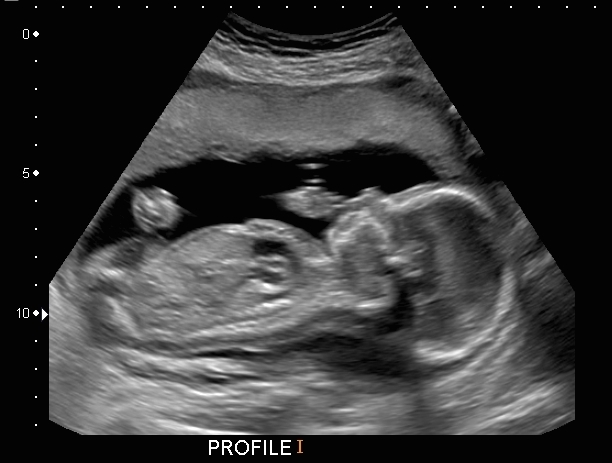 Baby currently weighs in at .78 pounds and is right on target for gestational age. T & I did find out baby's gender, but have not decided yet if we will share this time around, or wait until baby's arrival in July for everyone to be surprised like we did with C. I was dreaming of a gender reveal party with a beautiful white-frosted cake colored pink or blue, but T asked the tech almost immediately what baby's gender was, so that dream went flying out the window! #FAIL Maybe we'll still have a little party for our family so at least someone can have the fun of experiencing a gender reveal! The 'bump' made an appearance sooner this pregnancy since my abdominal muscles have been stretched this way before...my pregnancy book refers to this as the 'warmed-up-effect'. Blah. Most of my jeans and regular leggings became uncomfortable (particularly when sitting down) around 11 weeks, so I busted out the maternity leggings and a pair of skinny black maternity jeans, and haven't looked back since. I'm still able to wear most of my tops...three cheers for drapey sweater season! Not great. I'll be honest, during my first trimester, our mattress was begging to be replaced...which we finally bit the bullet and did...but now, my overall sleep still isn't great, at least in the mornings. Maybe it's due to baby sitting on my bladder, or maybe it's nature's way of adjusting my sleep schedule for the lack of sleep ahead, but it seems that with each passing week, I wake up earlier and earlier. Blah. Sushi...but let's be honest...I miss this even when I'm not pregnant since we live about three hours from the nearest sushi restaurant. It's also a bummer when our quarterly wine box arrives and I have to sign for a whole case of delicious wines that I won't be able to enjoy for many months to come. Yep! 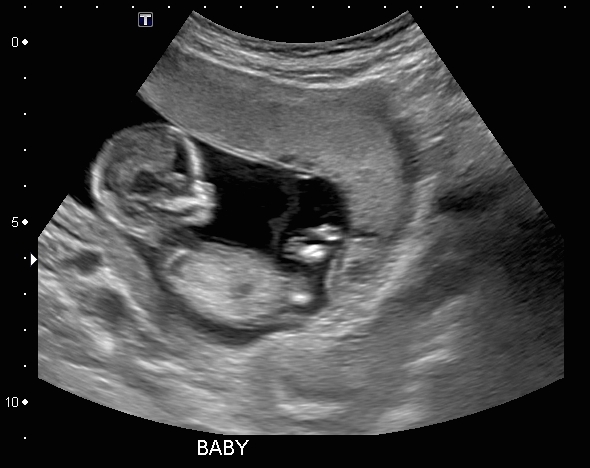 I started to feel baby around 15 weeks, and was able to feel baby kicking on the outside at 16 weeks. Nothing too consistent yet, and T hasn't had the pleasure, but in the coming weeks, I expect the kicking to be more noticeable on a regular basis. Sweets...but that could just be a by-product of the recent holiday season. Other than that, anything someone else wants to cook for me! Looking forward to spring and summer to have an expanded group of restaurants to visit in our 'everything comes to a halt between Labor Day and Memorial Day' neck of the woods. 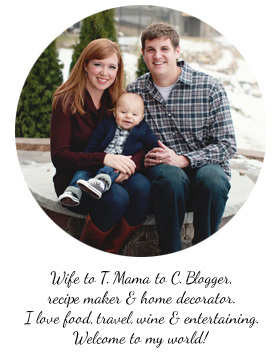 During my first trimester, the smell of coffee pretty much gave me instant morning sickness. A real bummer since T made it every morning before leaving for work, and tends to drink it by the potful on his days off. I do continue to allow myself the indulgence of one cup mixed with milk on most mornings, as the taste doesn't have the same effect as the smell. After 13 weeks, the smell of coffee hasn't really been bothering me at all which is great news! Most days starting from around four weeks thru about 13 weeks exactly, I experienced some level of morning sickness. It was never to the point that I couldn't hold down my lunch so to speak, but that queasy feeling got to be pretty extreme. I'm convinced it has been much worse this pregnancy than it was with C, but it could also just be that I now have an active and growing toddler who doesn't slow down just because I don't feel so great. Since 13 weeks, I've pretty much been back to normal on the queasy front. I've been very fatigued so far this pregnancy, and have had several days where it was hard to keep up with C's level of enthusiasm for life. I'll be honest, there have been some nights that T doesn't walk in the door until 7:30pm, and I can't keep my eyes open past 8pm. In other weird symptoms I've experienced, around 10 weeks, I had a heat rash appear on the tops of my hands. I thought it was a pretty odd symptom to have in the middle of winter when the temps outside were rarely over 30 degrees, but apparently it's a thing. Since then, I've also been dealing with awesome things like shortness of breath, skin breakouts from all the crazy hormones, and more headaches than normal. Joy. Warm weather! The temperature is finally starting to shift in the upward direction, and C and I have been loving every chance we've had to get outside for some fresh air and sunshine. 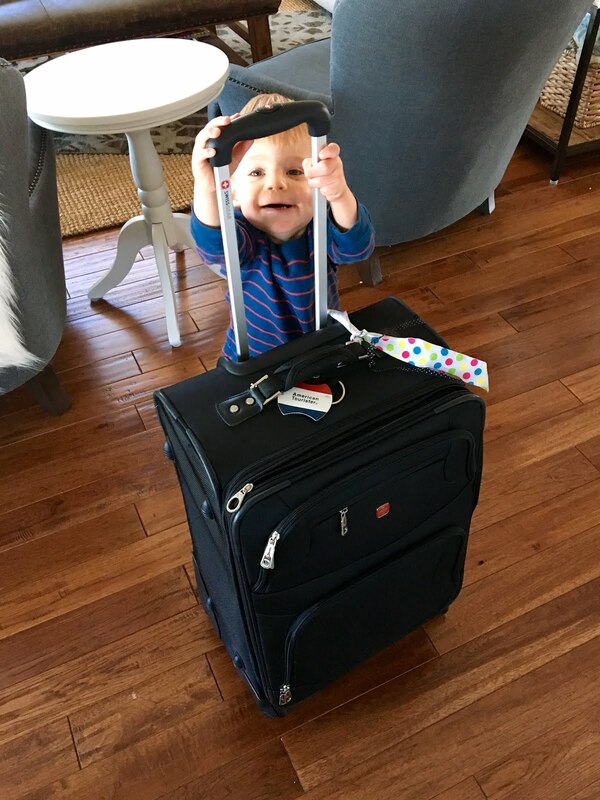 Next week, we are taking to the skies to visit the sunshine state, and can't wait to relax (as much as one can with a toddler by the pool and ocean) and soak up the sun. 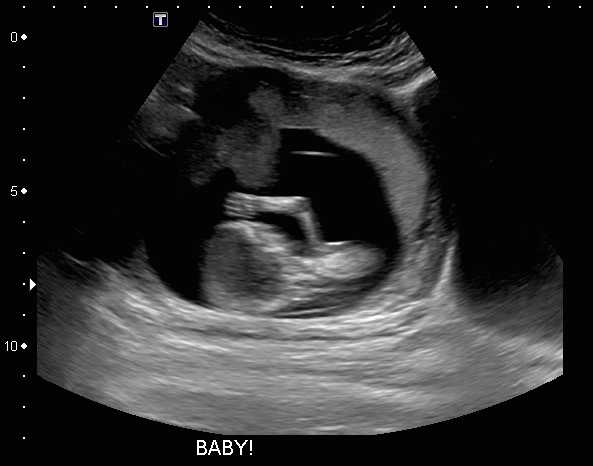 It's fun to see a couple of different ultrasound dates to see how baby is growing! 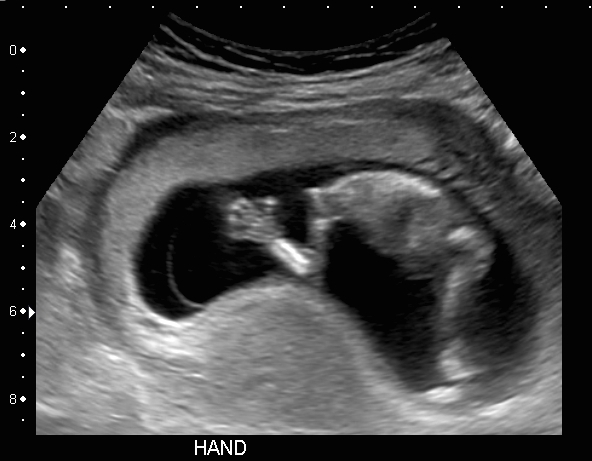 Hard to believe that at 13 weeks, baby looked like...well, a baby, and not just a blob! 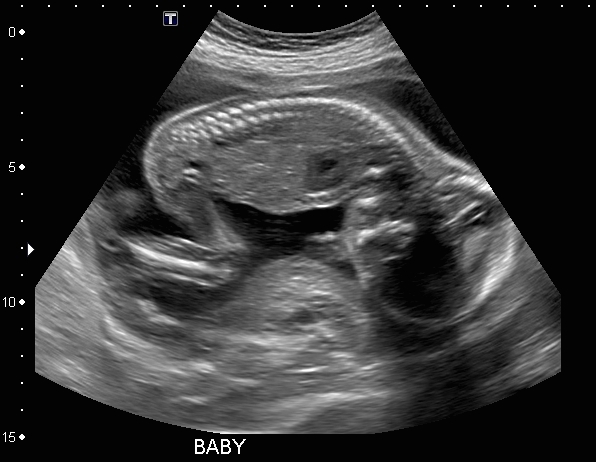 To give you some perspective, at 13 weeks, baby was only about 3 inches long and weighed approximately 1 ounce! 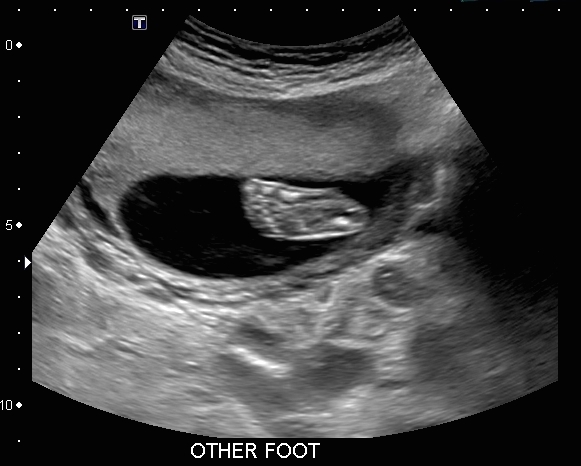 Such an amazing little miracle!